Our bots and human intelligence operatives scour closed hacker forums for compromised credentials. Then we immediately alert members who have been compromised. Funds stolen from a bank account, 401(k), or HSA? We’ll reimburse it. We even advance tax refunds that were fraudulently filed. Victim of identity theft or fraud before joining PrivacyArmor? We’ll fully remediate past and present incidents with no extra fees. Enrolled family members who pass away are still targets for identity theft. We fully remediate cases for loved ones who have passed on. If we find that your information has been exposed as the result of a data breach, we’ll inform you immediately and tell you how to take action. If a deceased family member is the victim of account takeover or fraud, we’ll fully remediate it. We look for your IP address so we can detect and inform you if it’s been compromised. We’ll alert you if it looks like someone has taken over your account and is posting unsavory material. Obtain a TransUnion credit report or score at any time from your PrivacyArmor portal. Check your credit score and obtain credit reports from all three bureaus every year. Our Privacy Advocates will help you freeze your credit files with the major credit bureaus. You can even dispute credit report items from our portal. You can easily lock credit files for yourself and any family members. We’ll reimburse you for stolen funds, including stolen 401(k) and HSA funds. We’ll even advance fraudulent tax returns. Identity theft increased 8 percent in 2017, impacting 16.7 million people. And when an employee is an identity theft victim, their employer can lose out on their time and engagement. It’s time to offer your clients more than just credit monitoring. We offer three levels of PrivacyArmor, our proactive identity monitoring service that sends alerts at the first signs of fraud. Our intelligence platform and monitoring capabilities detect, intercept, and restore the misuse of personal information that puts identities and enterprises at risk. Protect your employees, protect your company. Our hefty client list, which includes many Fortune 500 companies, means we have experience working with companies of all types. Customize PrivacyArmor for your clients, with employer-paid or voluntary payroll deduction options. Attractive commissions, no special licensing required, no E&O insurance requirements. If someone stole money from your retirement account, would you know it? You would with PrivacyArmor, which monitors all kinds of financial transactions, including wireless carriers and utility accounts. We even sweep the dark web for things like password resets, fund transfers, compromised credentials, address changes, and unauthorized account access. Oh, and we monitor credit, too. Get monthly scores and annual reports from TransUnion with PrivacyArmor, or from all three bureaus with PrivacyArmor Plus. Your reputation. Your company’s reputation. Your child’s safety. These are things at risk when a social account is hacked. 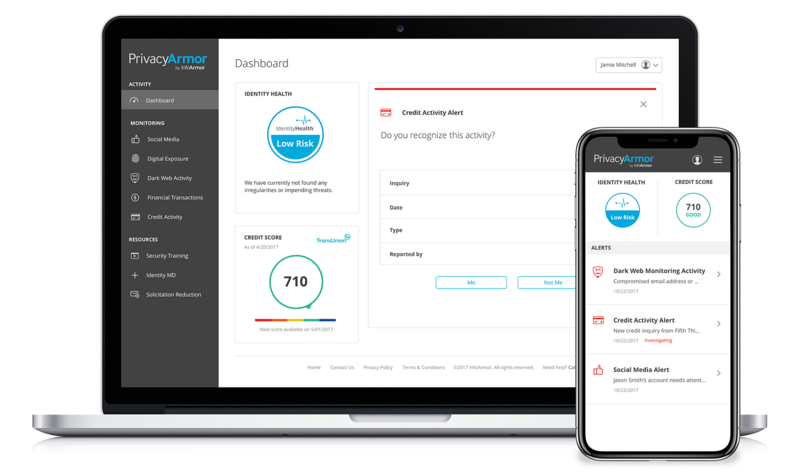 PrivacyArmor keeps tabs on social accounts for everyone in the family, watching for vulgarity, threats, explicit content, violence, and cyberbullying. Protecting Your Privacy: Best Practices for Mobile, Social, and Search Settings. There’s a 50 percent chance you had information compromised in 2017 — and that was just in one data breach. What do those odds mean for your family? What do those odds mean for your employees? PrivacyArmor extends identity protection to a spouse, children, household, and dependents. There’s a 50 percent chance you had information compromised in 2017 — and that was just in one hack. What do those odds mean for your family? What do those odds mean for your employees? Learn the identity theft statistics. After setup, there’s little work required. Our monthly updates let you know how your identity is doing, and if we find anything questionable, you’ll receive an immediate alert. If you tell us it’s fraudulent, we’ll call you and fix it. Who are you going to call? Us. Actually, we’ll call you. Each PrivacyArmor member has a dedicated Privacy Advocate® to fully manage and restore stolen or compromised identity. Our Privacy Advocates are experienced, persistent, and never outsourced. They’re also available 24/7 — and they don’t stop until an identity is totally restored. What size companies do you work with? We provide PrivacyArmor as an employee benefit to companies of every size, and tailor our offerings accordingly. What kinds of industries offer PrivacyArmor as a benefit? We have clients in all industries, from health, education, communication, and transportation to government, manufacturing, leisure, and more. We are used to working with all industries and protect all types of businesses. What security options can InfoArmor provide for my company? We offer different levels of PrivacyArmor as an employer-paid or voluntary benefit, with the option to add family members. Our highest level, PrivacyArmor Secure, is for businesses that need a more robust security layer, and includes employee security training and network security threat intelligence. How long does the average client onboarding/implementation process take? Average implementation takes 30 to 45 days, though there are certainly exceptions to this rule. Each client works with one dedicated implementation specialist who will be familiar with your business and your needs. In special situations and breach cases, we can integrate in less time, and have integrated in less than a day when the immediate need was evident. Are PrivacyArmor benefits portable for our employees? Yes, PrivacyArmor is portable at standard voluntary benefits prices, and are administered through direct billing. Can we offer PrivacyArmor to retirees, a subsidiary, or another group that is part of our company? Yes, we are happy to support retirees and other groups when a standard benefit is in place for the business. What is your experience with various platforms? Are your file specifications simple and easy to understand? InfoArmor partners with the top enrollment providers in the benefits market, and our integration with them is seamless. We are always expanding our relationships with enrollment platforms and administrators. We always review file specifications early in the implementation process. You can obtain a copy of file specifications through your InfoArmor sales director as part of the sales process if you’re interested in reviewing them prior to implementation. Do you offer services in the event of a breach? Absolutely. Our breach support programs are best-in-class employee solutions and cost effective for employers. I’m a broker. Do I need a license to consult with my client about InfoArmor’s benefit plans? No, you don’t need a license to consult on our sell InfoArmor products to employer clients. We offer generous definition of family, using an “under roof or under wallet” as our guideline. As long as the dependent lives within the employee’s household, or the employee supports the individual financially, they are eligible to enroll. Do dependents age out at 26? InfoArmor is not regulated by the Insurance Commission; therefore, dependents do not age out. As long as they fit into our “under roof or under wallet” definition, an individual may enroll as a dependent. "InfoArmor felt like it was family. I couldn’t believe how flawless it was."